We're back with another unboxing video from SuperHeroStuff.com to celebrate the release of the Spider-Man: Homecoming on July 6th. 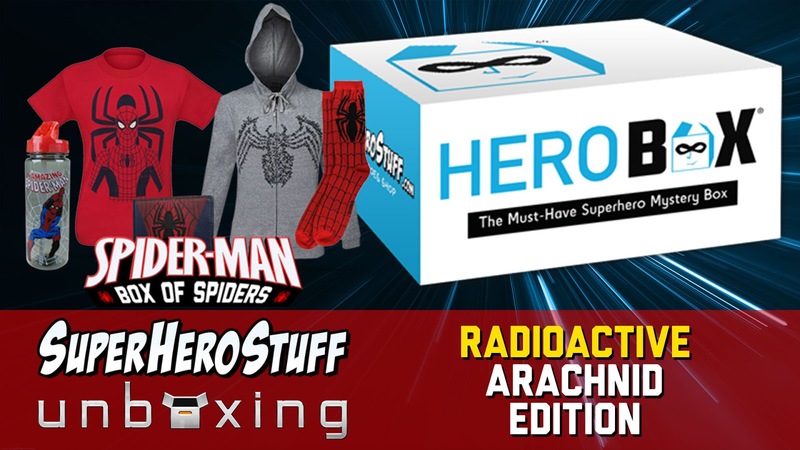 This edition of the HeroBox is the Spider-Man: Box of Spiders Radioactive Arachnid Edition! With Spider-Man: Homecoming hitting theaters this July it only seems appropriate that our newest box pay homage to the AMAZING, the SPECTACULAR, the REBOOTABLE Spider-Man! The box is overflowing with mystery items featuring Peter Parker's webbed-exploits from the past 55 years! Watch out...we're filling the box with Spiders that may or may not be radioactive! The box is limited to 300 and is broken down into two editions depending on your level of needed awesomeness. The Radioactive Arachnid Edition Edition is priced at $69 has a value over $100, while the Arachnid Edition is priced at $49 and has a value of $70. Below is a breakdown of what’s in each edition. Outerwear like a hoodie, jacket, or fleece. Friendly neighborhood accessories like buttons, keychains, magnets, and wallets.